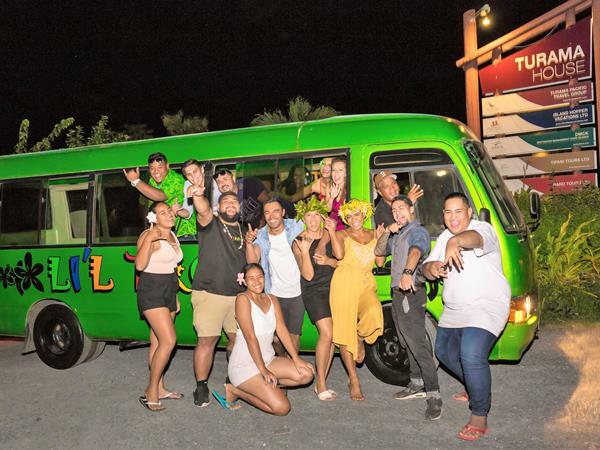 The safest way to see Rarotonga by night – join us on a 22 seater coaster, fitted with lights and sounds, big open windows, comfortable seating and friendly local guide! You will be picked up at your accommodation and taken to the Islander Hotel where your Nightlife Tour begins. Enjoy a special complimentary Going Troppo Cocktail or beer and souvenir LED multicolour wine glass or Going Troppo branded stubby holder as you get to know your new Going Troppo friends. Picture yourself and your partner sipping cocktails in colourful radiance! You will also be given a souvenir ei/necklace as an ID tag before you head off to some of the island’s hottest bars & night spots where you can dance the night away. There will be fun and music and a complimentary snack along the way to keep you going. Our experienced Driver and Tour Guide will ensure you are entertained and return safely back to your accommodation. Tour lasts approximately 6 hours, from 8pm to 1.30am, pick up and drop off from your accommodation between 7pm and 8pm, time will be advised when booked. This tour is not suitable for Children under 18 years. The Going Troppo Bus requires a minimum of 15 booked passengers to operate the tour. If minimum numbers are not met, we reserve the right to cancel the tour in which case clients who have made a booking on the cancelled tour may re-book or receive a full refund. Our party bus is available for private hire except Friday nights, to find out more call us PH 25 325 - No complimentary Going Troppo Cocktail or beer and souvenir LED multicolour wine glass or Going Troppo branded stubby holder, Ei ID tag for private hire bookings.